Departure: from the arrival of the ski lift of Cresta Rossa/Punta Indren 3270 m.
Rate: 520€ (ascent to Margherita hut included). The rate includes: private guiding fees, safety equipment (avalanche transceiver, shovel, probe). The rate excludes: ski-climbing skins, ticket of the lifts, half board in the hut for client and guide, beverage and extras in the hut. Day 1: meeting with the guide, ski lift to Punta Indren (3270 m). Departure to Mantova hut (3498 m) that will be reached in around 1,5 hours (around 350 mdifference in height). Dinner and overnight. Day 2: arrival to Zumstein Spitze, descent to Gnifetti pass and short ascent to Margherita hut. Time: 5 hours/5,5 hours. 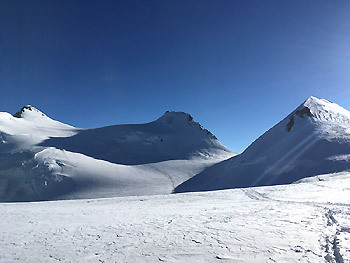 Difference in height: around 1300 m.
Descent: according to the snow conditions, it can be possible to arrive till Gabiet lake (arrival of the Gabiet lift at 2300 m). Clothing: high altitude clothes (waterproof and windproof jacket, light down jacket, polar pile or equivalent, thermal underwear, windproof pants, sunglasses, warm ski hat, warm ski gloves, a change). Equipment: crampons, harness, avalanche transceiver, shovel, probe (available from the guide), ski touring skis and shoes, climbing skins (can be rented). Description of the ascent: ski touring destination in high-altitude with overnight in refuge. 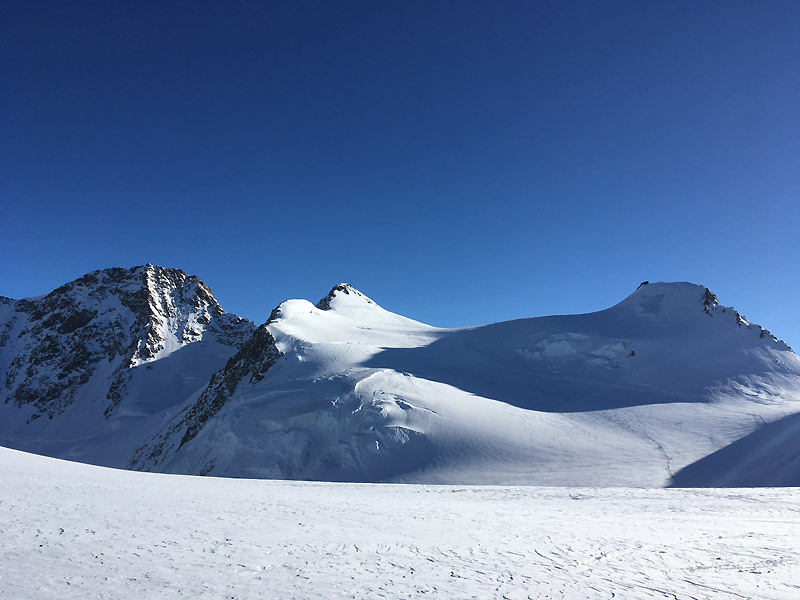 Crossing the Lys pass over 4000 m height, in the middle of the Monte Rosa glaciers, you will reach the highest ski touring peak of the Monte Rosa massif and then the highest refuge in Europe. The ascent gives a great satisfaction even to demanding ski touring lovers, offering wonderful panoramas.